The Mesh Renderer takes the geometry from the Mesh Filter and renders it at the position defined by the GameObject’s Transform component. Reflection Probes Specifies how the GameObject is affected by reflections in the scene. You cannot disable this property in deferred rendering modes. 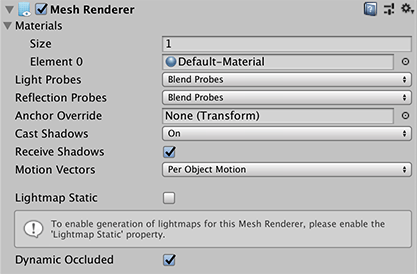 Lightmap Static Enable this check box to indicate to Unity that the GameObject’s location is fixed and it will participate in Global Illumination computations. 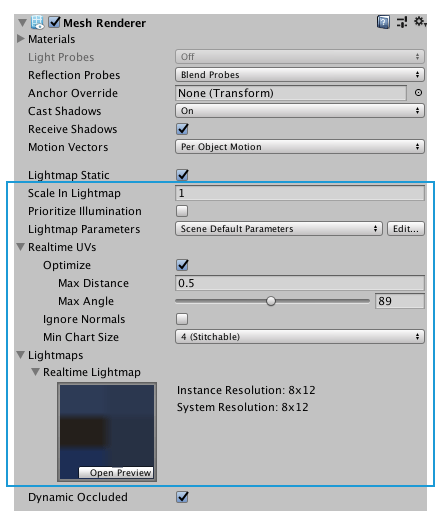 If an GameObject is not marked as Lightmap Static then it can still be lit using Light Probes. Dynamic Occluded Enable this check box to indicate to Unity that occlusion culling should be performed for this GameObject even if it is not marked as static. Scale in Lightmap This value specifies the relative size of the GameObject’s UVs within a lightmap. A value of 0 will result in the GameObject not being lightmapped, but it will still contribute to lighting other GameObjects in the scene. A value greater than 1.0 increases the number of pixels (ie, the lightmap resolution) used for this GameObject while a value less than 1.0 decreases it. You can use this property to optimise lightmaps so that important and detailed areas are more accurately lit. For example: an isolated building with flat, dark walls will use a low lightmap scale (less than 1.0) while a collection of colourful motorcycles displayed close together warrant a high scale value. It may be useful to set the anchor in cases where a GameObject contains two adjoining Meshes; since each Mesh has a separate bounding box, the two are lit discontinuously at the join by default. However, if you set both Meshes to use the same anchor point, then they are consistently lit. By default, a probe-lit Renderer receives lighting from a single Light Probe that is interpolated from the surrounding Light Probes in the Scene. Because of this, GameObjects have constant ambient lighting across the surface. It has a rotational gradient because it is using spherical harmonics, but it lacks a spatial gradient. This is more noticeable on larger GameObjects or Particle Systems. The lighting across the GameObject matches the lighting at the anchor point, and if the GameObject straddles a lighting gradient, parts of the GameObject look incorrect.